The human body is an extraordinary machine that maintains a delicate, internal balance. When something goes wrong with that balance, our bodies give us hints in the form of pain or illness. Being able to differentiate common aches and pains from something more serious, like pancreatic cancer symptoms, could save your life. On average, about 80% of the people affected will experience some type of “stomach” problems or pain. This is due to where the pancreas is located in the abdomen. A dull ache or pain in the upper abdomen or stomach area may be present. Typically, this pain will come and go, and could cause the back to hurt as well. A person may start to feel bloated or full after eating very little. Other symptoms are nausea, vomiting, and noticeable changes in bowel movements. Bowel symptoms include feces color becoming pale, or reddish like clay, and frequent and severe diarrhea. Pancreatic cancer symptoms can eventually affect a person’s entire well-being. Along with nausea, vomiting, diarrhea and loss of appetite, weight loss also usually occurs. Someone with a tumor developing in the pancreas the patients may notice changes in their skin such as the onset of jaundice, which is a condition that makes the skin and the white of the eyes appear a yellowish color. Some people also reported that their skin felt “itchy all over.” This itchiness is possibly caused by the pancreatic bile ducts being blocked. High blood sugar or diabetes may develop as the cancer in the pancreas progresses. 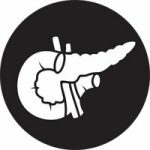 Pancreatic cancers that are referred to as neuroendocrine tumors occur in the part of the pancreas that produces insulin. These types of pancreatic cancers happen about 5% of the time and are considered rare. Neuroendocrine tumors can cause a multitude of other symptoms, in addition to the more common symptoms. Depending on which hormone the pancreatic tumor is affecting, symptoms may include a development of stomach ulcers, irritations to the mouth and tongue, hypoglycemia or an enlarged liver. Sweating, anxiety and facial flushing can happen as well. In a scientific study, researchers found that a small percentage of people experienced subtle changes in their body as early as six months before more noticeable symptoms occurred. Some of the patients recalled a sudden change in their taste buds. Things that they usually enjoyed such as smoking or drinking coffee, soda pop or wine, suddenly tasted horrible to them. A minute percentage of patients were noted to have had severe attacks of pancreatitis, months before their diagnosis. All the symptoms listed can apply to other illnesses and do not strictly indicate pancreatic cancer. Regular health exams are important because they give your doctor a base against which to compare future exams. Some symptoms such as nausea, vomiting, and diarrhea are common to many other illnesses, including food poisoning and the flu. Only thorough testing done by a physician or specialist can determine if the symptoms a patient is experiencing are caused by pancreatic cancer.